As polycaprolactone is a biodegradable polymer that continues to witness significant demand for the production of thermoplastic polyurethane (TPU). Wide application of TPU in various industries including medical device, painting, automotive industry, construction industry and packaging industry. Attributed to high degree of resistance to grease and oil, polycaprolactone is largely preferred over the other biodegradable polymers such as polyhydroxyalkanoates and polylactide (PLA). In addition, resistance to high elasticity and high abrasion has continued to boost sales of polycaprolactone among the TPU manufacturers globally. 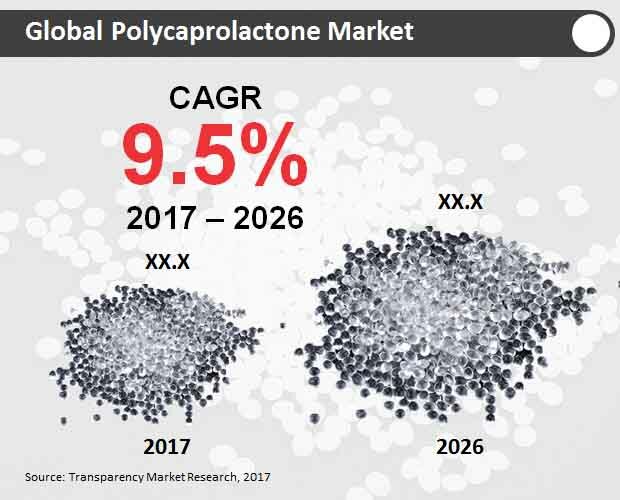 According to Transparency Market Research, the global polycaprolactone market is expected to represent a value of over US$ 300 Mn by the end of 2026. Demand for easy to manufacture and inexpensive drug delivery devices continues to increase among the end users. However, use of polycaprolactone in the implantable drug-delivery systems poses significant challenges such as low load bearing and slow rate of degradation features. Manufacturers of the medical devices are focusing on addressing these challenges and developing improved medical devices. Approval from FDA to use polycaprolactone in specific applications including sutures and drug delivery is expected to impact growth of the global market positively. As the need for wound dressing, surgical drapes, general purpose tubing, injection-molded devices and hospital bedding arises, demand for polyurethane continues to remain high in the healthcare industry. Researchers are also focusing on introducing innovative techniques in order to lower the cost of polycaprolactone. Demand for the polycaprolactone pellets continue to remain high as it is increasingly used for the production of 3D printer extruder, filaments and plastics. As the cost of pellets continue to remain low as compared to microsphere and nanosphere, demand for pellet form of polycaprolactone continue to witness high sales. With the growing demand to maintain lower noise levels in the commercial properties, builders are increasingly turning to rigid polyurethane foams. The polyurethane foams are effective insulation materials that are used by the builders while constructing roof, wall, doors and windows insulation. Demand for polyurethane foams will further remain bound to increasing production of the air barrier sealants globally. Builders are increasingly using polyurethane during the construction process as it allows preservation of the environment by reducing the usage of energy and conserving the natural resources. Growing need for enhanced versatility, durability, insulation properties and strength-to-weight ratios has revved up sales of the polycaprolactone in the global market. Application of polycaprolactone also allows design flexibility during the remodeling projects and new homes. These factors will continue to propel growth of the global polycaprolactone market. With the growing need to seal and encapsulate various pressure-sensitive microelectronic components, demand for polyurethane continues to rev up in the global market. As requirement for resistance against extreme temperature in the electronic components arises, manufacturers increasingly opt for polyurethane produced with polycaprolactone. Resistance to abrasion and tear resistance has led to increasing demand to incorporate rigid polyurethane foams that helps in insulating boats from extreme noise and temperature. Transportation of the major industrial components, medical diagnostic equipment, electronics and delicate glassware in a safe and protective manner continues to rev up demand for the production of polyurethane packaging foam. Growing need to manufacture various products will continue to boost sales of polycaprolactone pellet form in the global market. On the basis of form, the pellets segment is expected to represent the highest revenue growth, accounting for a value of over US$ 40 Mn by the end of 2017. On the other hand, the nanosphere form segment is expected to register the highest CAGR through 2026. Based on application type, the thermoplastic polyurethane segment is expected to generate significant revenues, recording a value of over US$ 30 Mn by the end of 2026. However, the dental implant application type segment is expected to register a robust CAGR during the forecast period. Leading market players operating in the global polycaprolactone market include Perstorp Holdings A.B., Daicel Corporation, Shenzen Esun, Corbion, Shenzhen Polymtek Biomaterial, BASF SE, Durect Corporation, Haihang Industries Co., Ltd. and Polysciences, Inc. The global polycaprolactone market is expected to witness significant growth attributed to increasing demand for production of thermoplastic polyurethane. With the growing demand for thermal polyurethane in various end use industries such as construction, automotive and medical industry, demand for polycaprolactone is projected to remain high. As need for rigid polyurethane foams continue to increase for insulating purposes arises, sales of polycaprolactone is expected to increase in the global market. Demand for the medical devices such as drug delivery systems has further contributed towards growth of the global polycaprolactone market significantly. The report offers in-depth insights on the crucial aspects of the global polycaprolactone market and provides information on the factors fuelling the market growth, competitive landscape, important segments and growth patterns. Growth of the global polycaprolactone market is mainly bound to various macro-economic and micro-economic factors. The report reveals that the global polycaprolactone market is mainly driven by surge in production of the thermoplastic polyurethane globally. As demand for thermal polyurethane is expected to remain high during the production of medical devices, sales of polycaprolactone will continue to rev up in the global market. However, increasing application of polycaprolactone in the implantable medical devices has continued to face various challenges such as slow rate of degradation and low load bearing. Manufacturers are focusing on addressing these challenges and developing innovating solutions and techniques for improved implantable medical devices. Polycaprolactone is also continues to witness significant demand in the construction industry. As the need for sound barriers arise in the commercial industry, manufacturers are increasingly opting for rigid polyurethane foams during the construction process. Moreover, increasing demand for resistance to noise in the residential industry is further expected to contribute towards growth of the global polycaprolactone market significantly. The builders in the construction industry are increasingly focusing on conservation of natural resources and by reducing energy. Moreover, growing need for preservation of environment has further led to an upsurge in demand for polyurethane among the builders in the construction industry. Surge in demand for insulating materials during the construction of walls, windows, roofs and doors is further expected to fuel demand for polyurethane globally. Sales of polycaprolactone is further bound to increasing production of the air barrier sealant globally. As the need for enhanced durability, versatility, strength-to-weight ratios and insulation properties arises, builders prefer opting for rigid polyurethane foams globally. In the next section, the global polycaprolactone market is segmented into form type, application type and region. On the basis of form type, the global market is segmented as pellets, nanosphere and microsphere. Based on application type, the global market is segmented as thermoplastic polyurethane (TPU), drug delivery, sutures, wound dressing, tissue engineering, orthopedics, dental implant and others. Key players in the global polycaprolactone market are Perstorp Holdings A.B., Corbion, Daicel Corporation, BASF SE, Shenzhen Polymtek Biomaterial, Shenzen Esun, Polysciences, Inc., Durect Corporation and Haihang Industries Co., Ltd.